Reports of interesting items found around the Tristan Islands. which provide one of the world's great beach combing sites! On Sunday 13th November 2011, the Fisheries Patrol Boat and Fisheries Rib went to Nightingale to do dredging and juvenile Lobster counting. Several counts were made by Eugene Repetto, Rodney Green and Norman Glass around Petrel Bay, including Spinners Point where the vessel Oliva went aground as well as at Stoltenhoff, whilst Andrew Green looked after the boat. On the return trip back to Tristan a stop was made at Cave Point to try and get a sample there. 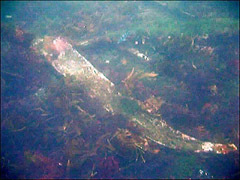 Norman and Rodney did a count just inside of Cave Point, outside The Pond and to their surprise, came across a wreck, which was thought to be that of a sunken yacht. Caves, and here Rodney and Norman took another look at the wreck, whilst Andrew tended the boat. They were able to confirm the structure seen on the previous visit on the 13th was too big to be that of a yacht and confirmed that it was rather a vessel with a length of 30 + metres. Some of the steel structure was visible and it looked like the bow of the vessel was pointing out to sea while the stern faced the shore. 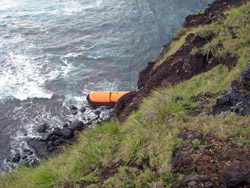 This would point to a likely case that the vessel was in that position due to a dragging anchor, rather than running aground. Hopefully in the next few weeks, further dives will allow us to study the sunken vessel in more detail as well as providing clues of her origin. Islanders cannot recall a wreck being seen here before and anyone with any information of a missing vessel should contact James Glass by email on jamespglass@gmail.com to help solve the mystery. On 22nd November another visit was made to the wreck site at the Cave Point on Tristan da Cunha, by James Glass, Trevor Glass, Rodney Green, Norman Glass, Julian Repetto and George Swain. 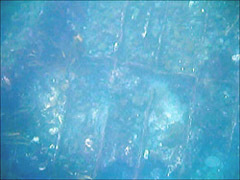 This time dive bottles were available and they were able to diving on the site, although the current was very strong and visibility not as good as when it was first found. 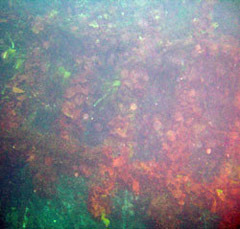 The team believe the wreck to be larger than originally thought. 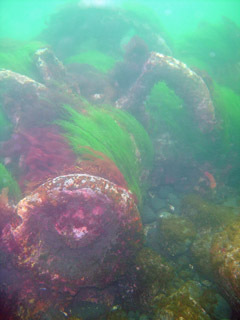 A few pictures were taken and one shown right shows part of a winch, probably used to haul the anchor. There will be further surveys when conditions in that area improve. 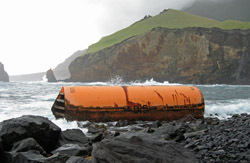 Tristan da Cunha has seen many shipwrecks as well as ship's flotsam and jetsam. So Islanders are always on the lookout for anything unusual at sea or along the island's beaches. On 4th May, Head of Communications Andy Repetto spotted what looked like a wrecked life boat at Boatharbour Bay Point as viewed from The Patches. Andy informed Administrator David Morley who informed Head of Search and Rescue Conrad Glass. Conrad set off with Neil Swain and Leon Glass to check it out. 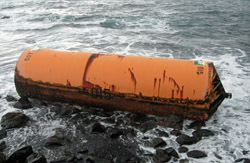 On arrival the object was found to be an orange mooring buoy, some 10 metres long, 2.5 metres high and at one end a large broken shackle was still attached. As there was a mark 50 T, perhaps the buoy weighs 50 tonnes? As there is little sign of rust or barnacles it is likely that it has been lost recently. Does anyone want it back? 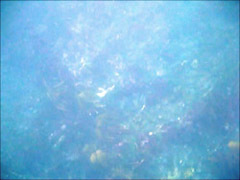 show the buoy above taken from the cliff above and below on the foreshore. The buoy nestled on rocks at the point south of Boatharbour Bay with Hillpiece and the Hillpiece Hardies behind. 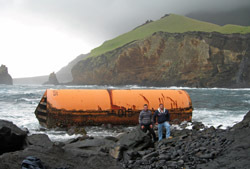 Neil and Leon are pictured by the buoy below.